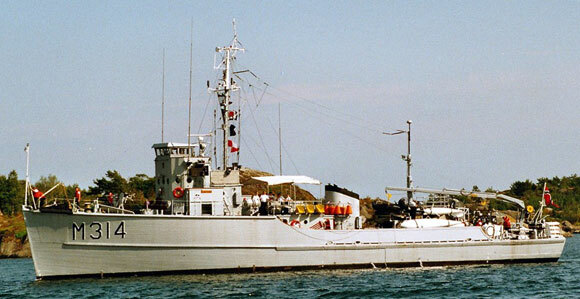 The Sauda class minesweepers were financed by the U.S. Government as part of the rearming of its European allies under the Military Assistance Program. M314 Alta served for a year in the U.S. Navy as AMS-104 and for 12 years thereafter in the Belgian Navy as BNS Arlon (M 915). She was taken over by the Royal Norwegian Navy in May 1966. Upon decommissioning in May 1996, after 30 years of service, she was turned over to the Alta Society (Fartoylaget KNM Alta). The vessel is owned by the Armed Forces Museum in Oslo. The Alta Society is responsible for her maintenance and operation. The minesweeper is the only one of her kind left in Norway. All minesweepers are named after Norwegian rivers. The Alta is one of the largest in northern Norway, well known after civil disobedience demonstrations a few years ago against plans for building an electric power station on the river. Their slogan, "Let Alta live" has become the Society's. M314 Alta is fully operational. Her regularly scheduled sailings, up to ten per year, include hospitality visits and training. Every third year she is drydocked at the Norwegian Naval Base Haakonsvern near Bergen, a 360 nautical mile voyage. A jubilee program is being planned for 2003 to celebrate M314 Alta's 50th birthday. M314 Alta at her museum berth in Oslo. She is beneath the Akershus Fortress. This building was started in the year 1299 as the King's residence. Copyright © 1997-2012, Historic Naval Ships Association.